Laura grew up in Lexington, KY and now provides care for people as a Registered Nurse at the University of Kentucky. She is currently working on her BSN, for which she is perfectly suited as Laura is one of the sweetest, most kind-hearted people I’ve ever met. She is a bubbly and fun person, always hosting a smile and inspiring one in those around her. Some of Laura’s favorite things are naps, coffee, music, pens and planners, and annoying our cat, Dewey. Laura is a creative person, always doing something crafty (I appreciate her artistic mind, even though the accompanying mess sometimes drives me insane). But most importantly, Laura always helps to brighten up my day and makes our life together fun and exciting. I love her incredibly and cannot wait to call her my wife. Steven grew up throughout KY but calls Lexington his home and now provides IT Support at the University of Kentucky. He never stops trying to improve himself, and plans to return to school to continue his education. Upon first impressions, you may be fooled into believing he is simply quiet, but he’s an observer and when he does have something to say, it’s usually worth hearing. Steven loves music, bourbon, puzzles, and spending quality time with me (and our fat cat, Dewey). 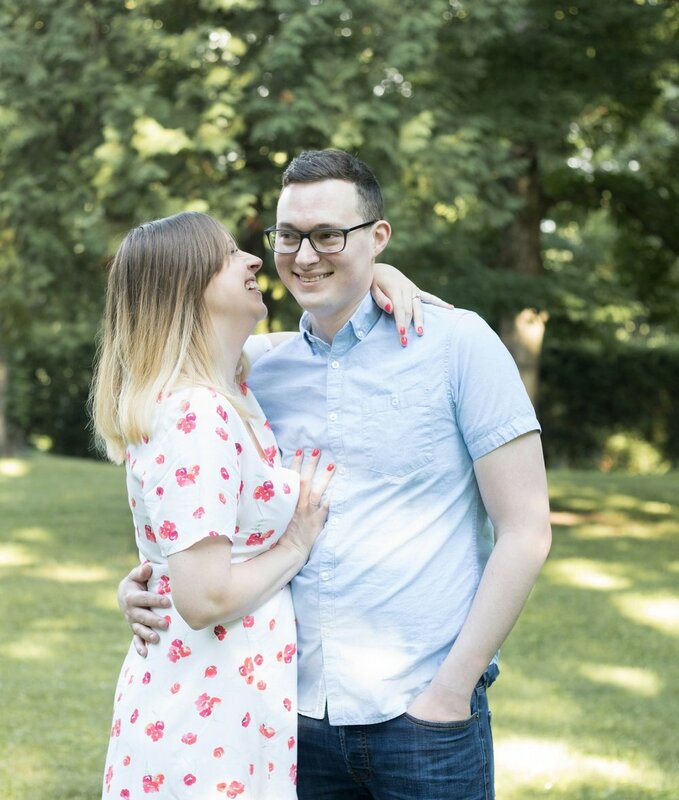 He also enjoys watching his favorite YouTube channels and constantly re-organizing our home (his attention to detail is one of the many things that draws me to him and sometimes drives me insane). But most importantly, Steven is very well grounded and helps keep me level headed during difficult times. I love him with my whole heart and cannot wait to call him my husband. We met on Christmas Eve 2006 (on that forgotten website called MySpace) and quickly realized we had a lot in common (same school, a lot of mutual friends, and a love for music, to name a few). Our first date was sometime in January of 2007 at Carrabba’s, followed by coffee and Scrabble at Common Grounds. We began dating on February 20, 2007 after a little nudge from a friend who suggested, “You should ask her out. She’s going to say yes.” Since then we’ve done a lot of growing, learning and maturing together. After 11 years, we finally got engaged on April 22, 2018. Now we can't wait to celebrate our wedding with our family and friends on June 1, 2019.